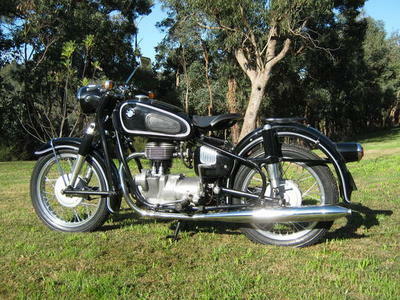 The VicRoads Victorian Club Permit Scheme [ CPS ] now allows members of the Victorian Ulysses Club Branches to make limited use of their historic motorcycles on the road network.
. Classic and Historic vehicles – manufactured after 31 December 1930, but more than 25 years before the date of the application for a club permit. From 1 February 2011, new conditions of use for club permit motorcycles apply. Under the new conditions of use, permit holders are no longer restricted to club sanctioned activities when using their motorcycles. Club Permit motorcycles can be used at any time for any purpose other than for the carriage of goods or passengers for hire or reward. A logbook is issued to permit holders to record the use of the motorcycles over the permit period. A log book entry must be made each day that the motorcycle is used (unless the vehicle is within 100 metres of the garaged address). A logbook must be carried in the motorcycle, or on the rider at all times the motorcycle is in use. It must be noted here that if the vehicle is used with out the log book being filled in for that day, if you are approached by the police, you could be fined for riding an unregistered vehicle. Also you could or will loose points from your licence. Further to this and more importantly it will be a black mark against the Ulysses Club Inc. It will then be up to VicRoads to decide what penalty the club will be imposed with. Please remember it has taken a considerable effort for the club to be able to achieve this privilege, for all Victorian Ulysses members, so let’s not spoil it for everyone. Only financial members of the Ulysses Club are able to apply for either a 45 of 90 day permit depending on how much use they expect to make of the motorcycle over a 12 month period. If a person obtains a 45 day permit but later decides that this is not enough, another 45 day permit may be purchased later on. However, no-one will be able to obtain a permit to ride their motorcycle for more than 90 days in each 12 month registration period. VicRoads may suspend or cancel a permit if the permit holder fails to comply with the permit conditions or engages in conduct which threatens public safety or undermines the integrity of the permit scheme. Permit holders operating with the transitional logbook are not issued with a label or logbook certificate sticker until the current permit is renewed after 1 February 2011. The scrutineer will advise you of all requirements and documents needed. You will then receive written verification by the scrutineer, in the form of a signed club permit application if you are a financial member of the Ulysses club and that you are permitted to register the vehicle, and that it is safe for use on the road. b) cross-check the Register against records provided by VicRoads and notify VicRoads of any discrepancies. 3. If the Club becomes aware that a club permit motorcycle operated by one of its members may not be safe to use on a highway, the Club will promptly notify that member of the suspected safety issue(s) and require that any such issues be rectified within 14 days. f) that a motorcycle operated by one of the members under a club permit has been disposed of ,with the intention of undermining the Scheme (that is, the motorcycle has been “sold” to a friend or relative so that another club permit log book can be obtained, but the motorcycle continues to be ridden by the previous owner). Please check with Vic Roads and Geoff regarding current fees as the following are only a guide. “I club plated my 1964 BMW 250 last week just to try out the scheme, and it is a smooth system. So I hope our members will enjoy being able to ride their "oldie but a goodie", as i am doing now. The documents required to make an application for a "Club Permit" are no longer located at the bottom of the article as "Attachments" and can be downloaded for completion. The application documents include contact details for Geoff to assist in the process. The Victorian Club permit scheme also featured on page 35 of the May 2013 Riding On. Contrary to previous posts, the forms related to this system should be obtained by contacting Geoff via email at the following ulyssescps@gmail.com The forms change from time to time for all sorts of reasons and we have decided not to make obsolete or incomplete forms available via the web. 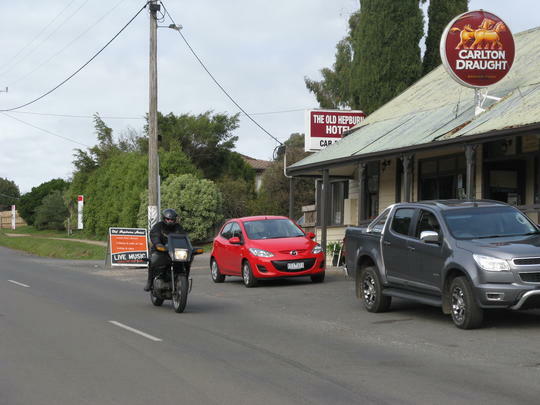 "It was mid 2011 that I was talking to some classic bike people and telling them of my passion for restoring and riding classic era motor bikes, when it got me thinking as to why the Ulysses Club don’t have such a system in Victoria. I knew only of a system in NSW. I thought there must be so many bikes lying around in members sheds, garages or the like, that could be restored and ridden in the Ulysses Club by Victorian members. And so I started the enquiries with Natcom and VicRoads, as to the feasibility of getting the permit scheme up and running. It was December 2011 when all paperwork was submitted to VicRoads, and after more paperwork going backwards and forwards, the Ulysses Club was finally approved for club plates, and that was on the 14/9/2012. Since the approval there has been a lot of development with a computer system and spreadsheets to comply with all the VicRoads legislation and requirements. I must mention here that Ulysses member, Derek Smyth did a great job in helping me with the system also. So the CPS has now been running for over 3 years, and I must say it has been working very well with great results. We now have over 212 bikes registered on CPS and there doesn’t seem to be any let up on enquiries. Also there would be approximately 35- 40 percent of these new registrations are new members joining the club, and this is giving our club some extra exposure. And now sadly, I get to the reason for this communication. For the past 9 years my wife and I have been traveling to the Northern Territory to work on remote cattle stations, during the cattle muster season. When I commenced the CPS it was all done via computer and not a problem as long as I had Internet connection, but since VicRoads changed the format for the CPS I have had to rely on the generous help of Ulysses members, Derek Smyth and of late Kevin White to handle it for me. They have both done a terrific job of helping the members with all their paperwork and emails, and I cannot thank them both enough. For without their input the CPS would not have moved forward as quickly as it has. I also need to thank Henry Rokx for all his help and support with updates and the Riding On Reports. My wife and I have been offered a work opportunity interstate and I feel it is unfair to all the members to have to chop and change emails etc. which has caused a few issues. Kevin White #10667, has kindly agreed to, and is looking forward to taking over the running of the Ulysses CPS on a permanent basis from now on. Also Derek Smyth and I will remain scrutineers to help Kevin when needed. I must say I have enjoyed immensely setting the CPS up and receiving photos of the restored bike, also reading how the bike came about. It has been a privilege to serve Ulysses members and give something back to such a great club, after 16 years as a member. But also I feel with each change in directorship, and new blood there comes new ideas and this only benefits the member in the long run. We will be sending an email to every CPS member giving details of the new changes, if you have not received your email buy the time this Riding On reaches you, please let Kevin White know. Sometimes things slip through the net, or members email addresses change without us being notified. Also I will be redirecting mail to Kevin to minimize any problems during the transition period. I would like to take this opportunity to thank all CPS members for their adherence to the VicRoads Rules, and the understanding that the Roadworthy Certificate for their bike needed to be implemented to remove the Club from any Litigation. This has held the Club in a very positive position with VicRoads. I would also like to personally thank Helena Gritton and Jen Woods for all their help and support along the way in getting the CPS up and running, as well the great help from our great NatCom office staff. Also note that everything including the gmail web site still remains the same. Its only the postal address that has changed, so please address your correspondence exactly as above and do not address it to Kevin White personally, as this only causes postal problems if redirection is needed. Remember the old classics are a great ride and are a chance to relive some of your youth, even if you ride it at a slower pace than before. Many thanks to Geoff for getting this great facility for members started and running so smoothly. ulyssescps@gmail.com as detailed above and in the Summer 2015 Riding On report by Henry Rokx. Melbourne Branch committee members have no authority in this process and cannot confirm any details required by Vic Roads. NB The system has been working well for 3 years now but your local branch is unable to provide any of the required documentation. As Kevin White (the registrar) passed away very recently recently please be patient regarding club permit matters. As some of you are aware, Kevin White was the contact for the Red Plate Scheme. Kevin passed away recently, and Paul Butler has now taken up the reins. Email ulyssescps@gmail.com for the postal address. All Club Plate Scheme enquiries should be directed to PAUL BUTLER – Email him at ulyssescps@gmail.com for the postal address.